Meet the tech community. Let’s get together to celebrate entrepreneurship and technology in Amsterdam at rockstart. Pitch your startup to a jury of venture capitalists and investors. The winner gets a free ticket to the 2016 global Pioneers Festival in Vienna. The theme in Amsterdam is the festival industry. Daniel van Drunen, CEO from Chasing The Hihat Group will be speaking to give all the attendees some inspiring startup thoughts. Enjoy the stories of the entrepreneurs who embarked on the lifetime journey to disrupt their industries. Pitch your startup to a jury of venture capitalists and investors. The winner gets a free ticket to the Pioneers Festival. Network within your community, get to know the upcoming stars and make valuable contacts. 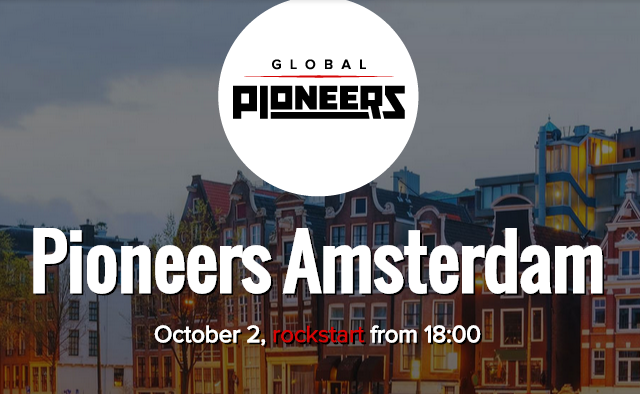 For more information and to sign up, go to the Pioneers Amsterdam website.